Happy 25th Birthday, Super Mario Bros! Nice!. It looks like Mario from the cartoons! When the plumbing gets tough the tough get Plumbing. You've caught the character really well. Great picture. "Mario Bros Plumbing. No leak too small." I can see Bob Hoskins voicing this guy. Or even better, Captain Lou Albano. 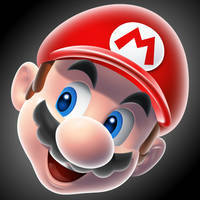 If Mario was designed by Americans, this is probably what he'd look like. You used his original costume! Kudos! I love this, he is constructed really well and also shaded well ^_^ good job. Ah, no school like the old school. Good work! Wow! I love it! Excellant job, man. Thanks, man. 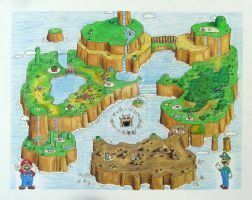 I sort of tried to look at the original and interpret from there rather than just basing it on the modern Mario. I like the crazed look in his eyes in the classic art. He reminds me of my high school geometry teacher here, who always threatened to confiscate our calculators if he caught us playing Mario on them. Awesome!